Venezuela’s Foreign Affairs Minister, Delcy Rodriguez, stressed Wednesday that the moral voice of the countries of the Bolivarian Alliance for the Peoples of Our America (ALBA) and the Caribbean Community (CARICOM) prevailed at the meeting of Foreign Ministers of the Organization of American States (OAS). “The only consensus resulting from this meeting is that there is no consensus, because the moral voice and strict respect for the international norms of ALBA and CARICOM groups prevailed over this interventionist group of disrespect to international law…” – diplomat said in a phone call aired in local television. Earlier, the OAS meeting of foreign ministers to discuss the situation of Venezuela was suspended –at the request of the CARICOM countries– after lack of consensus among the 34 delegations present at the meeting. On the other hand, Rodriguez informed that, on the orders of President Nicolas Maduro, Venezuela will attend the next OAS meeting to be held in Cancun, Mexico, from June 19 through 21. “We will arrive in Cancun from the hands of the people, to defend the legitimate rights of Venezuela,” – added the minister. 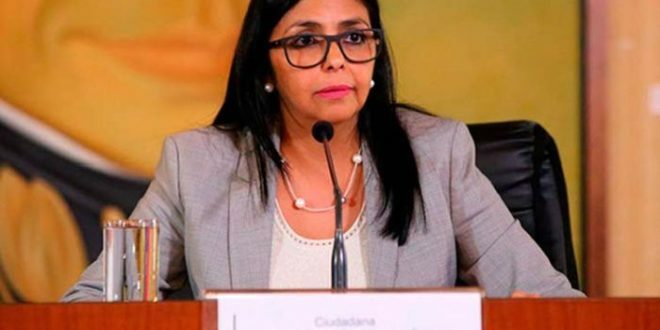 She said that at this meeting, she will ratify Venezuela’s willingness to withdraw from the international body –a process that began 28 April and lasts 24 months– from where a plan of attack and violation of the sovereignty and independence has been formulated against the Bolivarian homeland.